Tuesday, November 29th he wants all All Books - 25% discount! In stock books only - no special orders. And other great discounts like our 40% discount on Espresso Cup Christmas and Halloween ornaments - This is a total steal! Get them while they last! PRAIRIE POINT TREE - No sewing experience needed for this great table decoration so bring your non-sewing buddies and go home with a great decoration for your table.... No Session Fees - Cost of kit $15.00 - Tuesday, November 29th from 11m - 2pm - please call to get registered so we have sufficient kits ready for you. KITCHEN ESSENTIALS - Join us for a fun evening of making some great gifts - we will be making all three items - Microwave Bowls, Tree/Bouquet Napkins and Bowl Covers. Any of these items would make great gifts by themselves, but give all three as a gift and you will be on the favorite list! NO Session fees - Cost of individual kits only. Tuesday, November 29th from 6 - 9pm - Please call to get registered so we have sufficient kits ready. Bring sewing machine, decorative threads and general sewing supplies. QUICK QUILT AS YOU GO PLACE MATS - join us in this session and make some great place mats in no time at all - combining piecing with quilting and get those gifts done quicker! NO Session fees - Cost of kits only - includes all fabric and batting for 4 mats - $22.00. Wednesday, November 30th from 1 - 3pm - Please call to get registered. Bring sewing machine, thread and general sewing supplies. Bring sewing machine, thread and general sewing supplies. 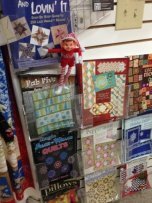 POST CARDS - This is a fun way to send a special mini quilt or other design to friends and family for Christmas and the holidays! Gather up a bunch of scraps or 5" squares, some embellishments, buttons, thread, yarn, what ever you think you might want to create with and come learn some fun ways to create fabric post cards - create trees, snowmen, birds, flowers, etc. .NO session fees - Cost of post card only - $6.00. QUICK PILLOW COVERS - Looking for a fast way to change up the look of your sofa, chair or beds for the changing season or holidays? How about quick pillow covers that are beautiful and easy to make and store flat - the possibilities are endless. NO session fees - Cost of pillow kit only - $18.00 makes two matching pillow covers. COMING SOON - Call to get registed! PANEL QUILTS - Need a pretty quilt for a gift, but are short on time? How about a quilt made with a beautiful panel - we will guide you through creating the quilt in this session and you will be ready to quilt and bind in time for Christmas! NO session fees - Cost of quilt kit only - $36.00 kit includes fabrics for top and binding. FOLD N STITCH ORNAMENT - These fold n stitch ornaments are from the same designer as the popular Fold N Stitch Wreath, and Candle Mat. Join us as we fold and stitch our ornament that will hang beautifully on your tree or gift it to someone else! NO session fees - Cost of Kit only - $15.00 makes one ornament. TEA TOWELS - We all need tea towels for our kitchen or they could also be used as special guest towels in bathrooms - join us for a fun time creating tea towels for the Christmas and holiday season, or make them for a gift and include other seasons of the year.... NO session fees - Cost of Tea Towel and embellishments only. Bring sewing machine, threads and general sewing supplies. NEW YORK BEAUTY BOWL - Have you seen the new bowls made with fabric and then molded over a bowl for a stunning table decoration? Great for sewing supplies, hair clips, desk supplies, or just about anything you need a cute way to store and display.... Join us for a session on making one of these cool bowls. No session fees - Cost of kit only - $19.50 makes one bowl. Bring sewing machine, decorative threads and general sewing supplies.